Some people look to their dial for more than just the time. Indeed, watches can do a whole lot more than tell you when it’s 5 o’clock. 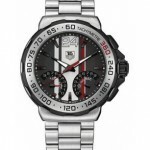 And it was with those people in mind, athletes and sportsmen alike, that Tag Heuer equipped the Formula 1 men’s chronograph CAU1115.BA0858 with 3 chronographic counters and a tachymeter. This timepiece comes from a collection of about 20 and uses a simple black and white design with a brushed stainless steel case, band, and bezel. The silver 12 o’clock, hands, and hour indexes are all toned with luminescence for good readability in low light. 3 sub-dials with a spiral pattern rest under the solid gray dial, including one with accurate measurement down to 1/10th of a second. The polished steel bezel is fixed, displaying a tachymeter scale to measure speed. Tag Heuer puts all of it timepieces through rigorous testing to monitor each of its suppliers and verify sound construction of high-quality components. The Swiss quartz used for the movement of the Tag Heuer Formula 1 CAU1115.BA0858 ensures an extremely accurate chronograph. Also, like all watches in the Formula 1 collection, an end-of-life indicator alerts owners when the battery needs to be replaced while still keeping perfect time. It does this by moving the second hand at 4-second increments for a period before the battery is exhausted. 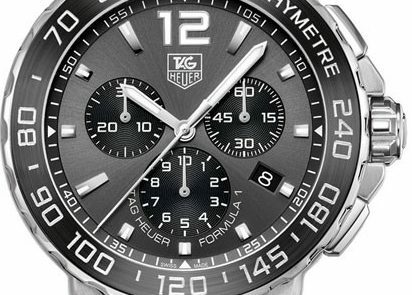 The Tag Heuer Formula 1 CAH7011.BA0860 records 1/100th of a second and has a more sporty design. I found this watch priced at $2,000 online. But if you prefer a more sporty look to match the watch’s features, or even more technical gauges, there are more brightly accented versions in the Formula 1 collection. A couple of them reduce the sub-dials to a 1/10th and 1/100th of a second reading with the electro-mechanical movement recently patented by Tag Heuer. I even found the one on the right offered for a few hundred dollars less. Still, some will find the versatile look of the Tag Heuer Formula 1 Men’s Chronograph CAU1115.BA0858 the most appealing for everyday life. 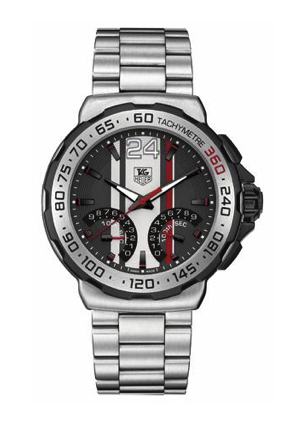 Tag Heuer has some unique choices in the Formula 1 collection. I like the Men’s Chronograph CAU1115.BA0858 because it’s not just geared for use on the race track. And anyone who’s ever showed up late because their watch is slightly off can appreciate the EOL indicator as a thoughtful feature. 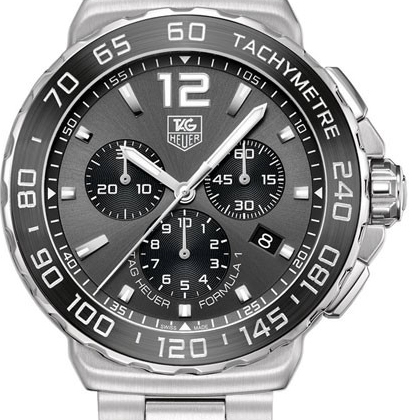 The price of this watch isn’t cheap, but I would say it is more than adequately represented with technical performance, style, and a dial bearing the Tag Heuer name. If it’s still over your budget, others in the collection like the one above can be had for a bit less.